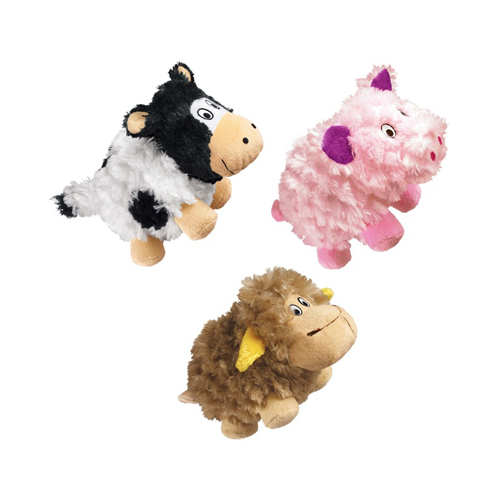 The KONG Barnyard Cruncheez are soft farmyard cuddly toys with a crackling and rattling bottle inside them. This provides even more entertainment. Barnyard Cruncheez are available as three funny characters: a cow, a pig and a sheep. The Barnyard Cruncheez combine a cute cuddly toy with an attractive toy for your dog. The farmyard cuddly toys have a crackling bottle and a rattle inside them. The plush of these toys is nice and soft for your dog. Have you used KONG Barnyard Cruncheez before? Let us know what you think about this product.